Did you know that access to parks and green spaces increase physical fitness? Seems obvious, right, but now there is a growing body of evidence demonstrating that parks are good for your health. Losing weight is America's most popular New Year's resolution. And many people stick to their resolutions -- well, at least for the first month or so. With more than one-third of adults and nearly 20 percent of youth considered obese in the United States, it's no wonder we all want to shed a few pounds. We know that eating better (more fresh fruits and veggies) and getting a minimum of 30 minutes (60 for kids) of exercise each day can help us reach a healthier weight, but how does our environment impact our health and wellness plans? Actually, quite a bit. Did you know that access to parks and green spaces increase physical fitness? Seems obvious, right, but now there is a growing body of evidence demonstrating that parks are good for your health. Gallup's Well-Being Index found that people who live in close proximity to parks have fewer headaches, lower obesity rates and even as many as 25 percent fewer heart attacks. Another study found that greener (more trees and vegetation) neighborhoods are correlated with lower body mass indices among children. And in one town, it was discovered that for every dollar invested in trails, there was a medical cost savings of $3. Not only does access to parks, playgrounds and green space increase our likelihood of being physically fit, but the prevalence of parks and green spaces in our communities has also been associated with lower rates of asthma among children, higher property values and even crime reduction. Unfortunately, just as obesity is not evenly distributed across socioeconomic lines, neither is park access. According to the Centers for Disease Control and Prevention, only 50 percent of young people have parks or playground areas, community centers, sidewalks or walking paths in their neighborhoods. 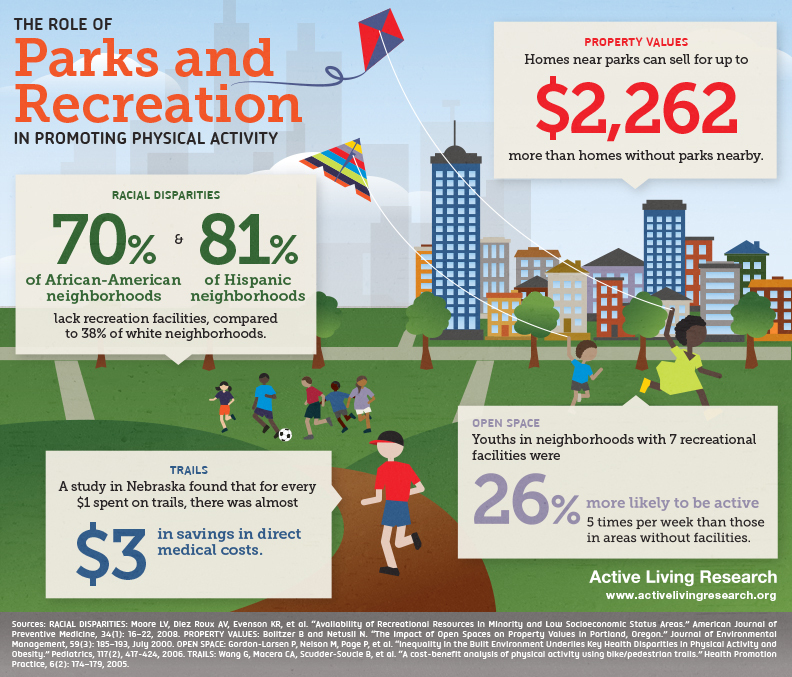 If you look behind that statistic, you will see the disparities: 70 percent of African-American and 80 percent of Latino neighborhoods lack parks and recreational facilities. The Trust for Public land released a report on the status of urban parks in America's largest 40 cities. San Francisco, Boston, New York and Washington, D.C. are providing the vast majority (more than 90 percent) of residents with easy access to parks. On the other hand, in cities like Louisville and San Antonio, less than one-third of the population is able to walk to a park. Other cities in Texas are not fairing so well, either. Yet, the Lone Star State is poised to cut its parks' budget so deeply that seven state parks may need to close their doors. So, what's being done to increase access to green space for our increasingly urban population? Yesterday, I was honored to share the virtual stage with presenters from the National Park Service and the National Recreation and Park Association on a CDC Division of Community Health webinar, Advancing Community Health Through the Use of Parks and Recreational Facilities. We discussed the public benefits of parks and green spaces. I learned of an effort in the Bronx to convert an old cement factory into a park. The new park has given area residents access to the Bronx River, which now teems with paddlers. Also in New York City, an old railroad line bridging a river was converted into a trail for hikers wishing to cross the waterway on foot. During the webinar, I had the chance to tell participants about important work being done in the Los Angeles area by the San Gabriel Mountains Forever campaign. The campaign, which includes the Sierra Club, is working to expand wilderness and scenic river designations and establish a National Recreation Area (the other NRA) in the San Gabriel Mountains to protect the landscape and provide recreational opportunities for the Los Angeles community. The establishment of the NRA would improve guest services and make the San Gabriel Mountains eligible for LA's "Transit to Trails" program, which increases park access for millions by providing busing services for underserved communities to visit the park. We've got a long way to go to green our communities and ensure equal access to the outdoors across America. Supporting funding for parks and green spaces, like the San Gabriel Mountains National Recreation Area, is critical to improving the health and wellness of so many of our communities. Besides, our parks are one investment that pays dividends. For more by Jackie Ostfeld, click here.